Sadly, some of Bill Johnson’s church members have had to leave Bethel’s ministry base without that “dunamis power” (which they interpret as the power to do healings, signs and wonders). They have had to leave and go to UC Davis Medical Center in order to save the life of their child. Bill Johnson and all of his claims of miraculous power, Randy Clark and all of his leg-lengthening chicanery, Bethel children’s minister, Seth Dahl and all of his angelic visions, have been utterly and totally powerless to heal the child of Bethel’s “Music CEO,” Joel Taylor. According to CBN, Bethel Music CEO, Joel Taylor, is pleading with the public for prayer for his child to be healed. The boy’s name is Jaxon, a handsome two-year-old who is suffering from intestinal leakage, vomiting blood, lowered brain activity, respiratory illness and possibly damaged kidneys, and he is in immense pain (these descriptions are cited by CBN as coming from Taylor’s social media). 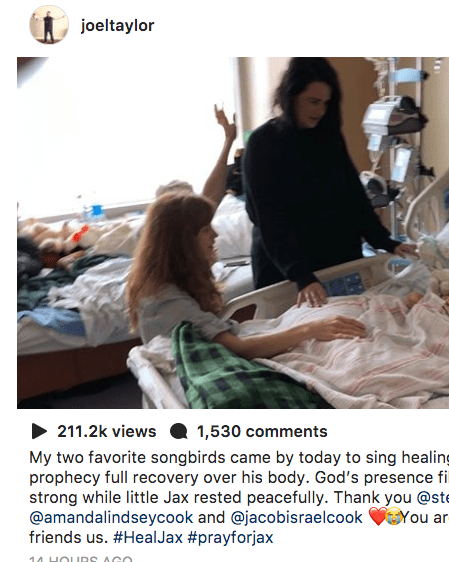 Bethel members went to the hospital, according to the social media post above, to “create an atmosphere of worship” in order to create “an atmosphere for God’s presence and creating an atmosphere for God’s presence is creating an atmosphere for miracles.” As the poor child was receiving medical attention at a hospital in Intensive Care, he saw improvements in his condition, which the cultists credited to their miracle-creating atmosphere. Of course, healing miracles performed in the Scripture by Christ and the Apostles were (A) immediate and instant (B) complete and total and (C) done without accompanying medical care, which could just as easily be credited for improvements. Sadly, the Bethel cultists say “we just need God to finish the miracle.” In the Bible, there were no impartial or unfinished miracles. Faux-miracles may be fun to talk about and fake healings may get people enthusiastic, but time after time Bethel Church in Redding proves itself absolutely and completely unable to heal people of seriously debilitating illnesses in any kind of way that cannot be contributed to psychosomaticism or conventional medical care. Last year, cancer-stricken Nabeel Quereshi sought healing at Bethel Church in Redding, California, and the cultists prophesied over him (as he reported at the time) that he would be physically healed. We have also brought to you screenshots of Bethel members telling Quereshi on his Facebook page that God told them he would be healed of cancer and would not die of it. Nabeel Quereshi, after seeking healing from the epicenter of faith healing, died with a tremendous (and commendable) surplus of faith. It did not work a miracle. And yet, Bill Johnson writes on the Bethel website that if someone is not healed it is because of the “deficiency on their end,” rather than the will of God. The theology of Bethel Redding is that the atonement of Christ – because of a Scripture-twisting misinterpretation of Isaiah 53 – provides for the healing (according to Johnson) of all people suffering from all illnesses. One would suppose that goes for the child of Bethel’s Music CEO. 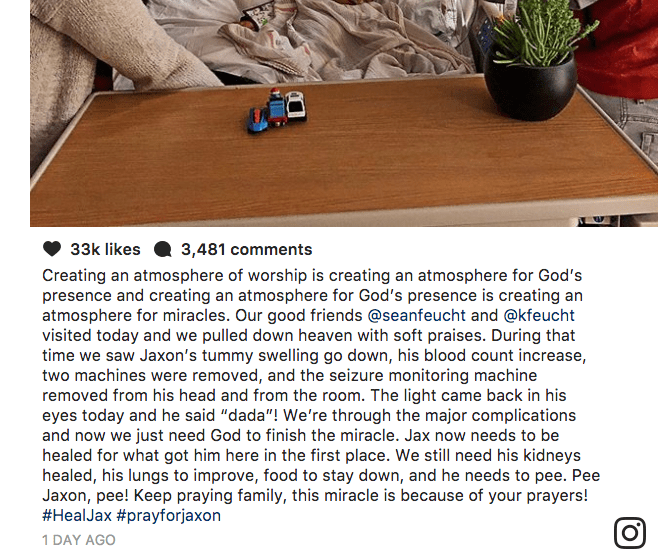 The question is why isn’t Bill Johnson, Randy Clark and Seth Dahl in that hospital rooming healing Jaxon at this very moment? Bethel Redding cult leaders never seem able to heal themselves or those closest to them. 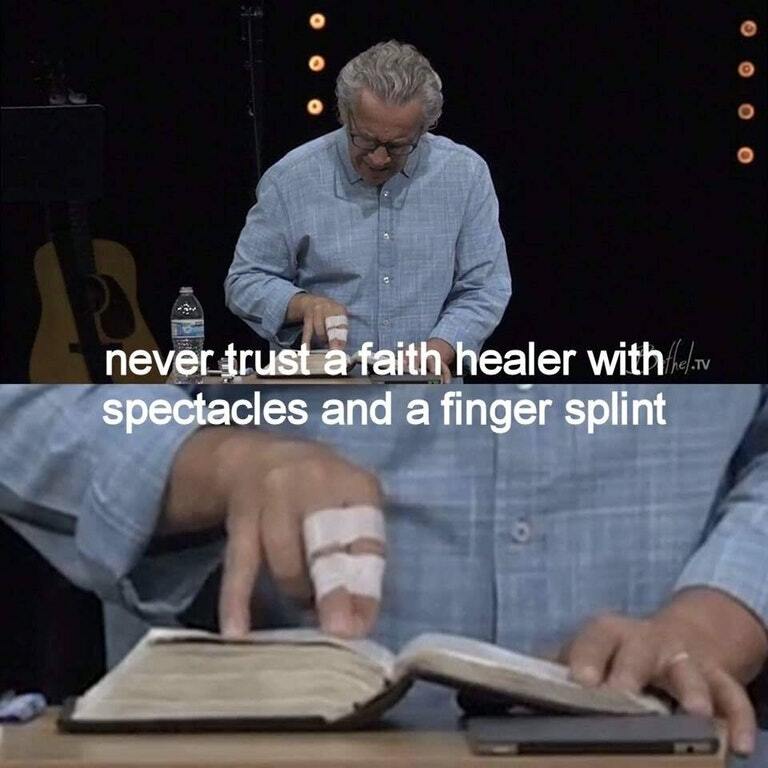 Can Bill Johnson not heal his hurt finger or far-sightedness? By the way, in this YouTube video, Bill Johnson speaks of healing someone from their need for glasses…while himself wearing glasses. In the video below, Bill Johnson says that “God is just looking for a prayer he can agree that he can cooperate with and fulfill his purpose…” In the video, Johnson claims that all sickness should be able to be healed by faith, and lacking that healing, the problem comes from the individual. Healing, according to Johnson, is an expression of God’s righteousness. Physician, heal thyself. Bill Johnson, heal this boy. If you can’t command and call down the power of God, who on Earth can? In the meantime, there’s a very, very sick boy in the hospital who does need to be healed. We should pray for his healing and God can heal him. His parents’ friends set up a Go Fund Me account to help with their expenses. If you would like to help support the family financially or support the expenses related to this child’s medical needs, you can do so by going here. Currently, the GoFundMe page is still active, although they have exceeded their goal of $150k dollars and have raised 165k thus far. Nevertheless, we certainly do not discourage you from giving. Also, please pray for those taken in by the cult of Bethel Church in Redding, and pray that they might be delivered of such wicked, helpless, impotent deception.